The study of anthropology includes many different areas of human interest such as language, culture, evolution, and regional landscapes. Trying to find the most reliable online anthropology resources can seem like a daunting task. Luckily for you, Best Online College has done a lot of the work already. This list of 50 great resources feature general information on the study of anthropology, along with resources that focus on the four main anthropological disciplines: archaeology, biological and physical anthropology, cultural and social anthropology, and linguistic anthropology. So, whether you’re working on a research paper or just curious about human history, this resource guide is a great place to start. Aesthetic Realism – A New Perspective for Anthropology & Sociology features articles on worldwide anthropology, racism, evolution, and labor respect. American Anthropological Association offers current topical news pertaining to all anthropology disciplines, a guide to professional development and general resources for students and anyone interested in learning more about anthropology practices. American Anthropology Obituary Index features an alphabetical, extensive directory of well-known American anthropologists’ birth and death dates. 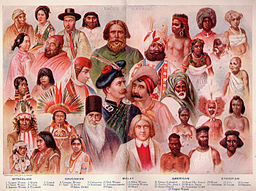 History of Anthropology is an academic paper that researches slavery in the Colonial era, polygenism, different types of mankind, anthropometry, and much more. Images of Anthropology includes stock photography of various world cultures, landscapes, and wildlife from ancient through contemporary times. The Peoples of the World Foundation offers facts and history on all of the Indigenous Peoples in various countries worldwide, global current news and updates, a list of available scholarships, and an overview of causes and campaigns that are currently affecting Indigenous Peoples. Royal Anthropological Institute houses Britain’s national anthropology library, which includes maps, manuscripts, multimedia, journals, and academic research on a vast array of topics pertaining to anthropology. The institute as well features an online anthropological index that is significantly detailed with research on Latin America, Eastern Europe, Africa, and Asia. Science Daily offers over a hundred articles pertaining to anthropology, human cultures, evolution, Indigenous Peoples, and archeology worldwide. Smithsonian National Museum of Natural History Department of Anthropology features collections and archives of American anthropology materials, information on research and training programs, and details on recent exhibitions. University of Michigan Museum of Anthropology includes an online digital image database and catalog that represents over 60 years of archaeological work in the United States, Asia, Europe, and Latin America. This site als offers news on current anthropological research happening worldwide and information regarding the museum’s current artifacts and exhibits on display. The Archaeology Channel includes a vast array of streaming videos from archeological sites throughout the world. Audio interviews, commentaries, and news from Archaeologica are also available. Archaeology Info has a history and timeline of human evolution, a glossary of common archeological terminology, and in-depth information with an index of online articles pertaining to human ancestry. Biblical Archeology Review, published by the Biblical Archeology Society, includes nondenominational academic papers, scholarly debates, multimedia, and current news regarding archeology theories and facts about the regions named in the Bible. Digital Archeological Archive of Comparative Slavery is a relational database that documents the lives and cultures of enslaved Africans and their descendants in the United States during the Antebellum era. The archive includes papers and manuscripts that have been previously presented at various conferences from 2007-2002, summaries of fieldwork, and information on querying the database. Historical Archaeology in the French Caribbean, published by the Journal of Caribbean Archaeology, documents the history of the Caribbean region regarding African and African-descended cultures, agriculture, landscape, and the colonial origins over the past 40 years. The International Center for East Asian Archaeology and Cultural History (ICEAACH) includes comprehensive information on various East Asia nfieldwork projects from the past and present; an online catalogue and library with maps, articles, and multimedia; and up-to-date news on research, workshops, and events pertaining to current East Asian issues. National Park Service Archeology Program: National Archeological Database has approximately 350,000 indexed archeological U.S. reports, maps of the country portraying areas of cultural and environmental resources by country and state, and permit records from 1907-1986 that reveal information relating to archeological projects on federal and Indian lands. The Prehistoric Society compiles research and academic papers on worldwide archeology of the earliest human origins up to the inception of written records. The group publishes an annual journal and a topical newsletter three times a year; society membership is open to all with special rates available for students. Society for American Archaeology gives a fantastic general overview on a wide variety of resources and information pertaining to American archaeology for students, amateurs, and working archeologists. Included are commonly asked questions and answers, a children’s area with games and activities, an outline of archeological laws and ethics, and current news. The Society also lists upcoming events as well as available job opportunities, grants, scholarships, and awards. Virtual Library of Archaeology offers a complete guide to various academic papers by topic, region, institution, country, and continent. The library also features archeological funding options, galleries of archeological images, a Q&A section, and virtual archeology site tours. Becoming Human provides an interactive timeline on the history of human lineage from the past seven million years, games and activities on the concepts of human evolution, a current news article archive from 2005-2010, and overall, general facts on the progression of human evolution. Biological Anthropology: Fifth Edition details the belief systems, scientific methods, and history of biological anthropology. This resources includes an overview on primates, the human genome, traits, genes, and genetic cloning as well as an evolutionary timeline, historical facts and research on evolution, and much more. Forensic Anthropology Information Guide offers a free general overview of forensic science with facts and details on forensic ballistics, crime scene investigations, DNA, serology, toxicology, and much more. Videos from working forensic professionals are included, as well as a complete timeline on the history of forensic science. PBS’ Evolution features articles, research, and activities for teachers and students on topics such as the science behind evolution, extinction, Darwinism, religion, and the history of humans. The evolution library includes a wide array of multimedia images and videos that are browseable by specific evolution topics. RACE a compelling project funded by the American Anthropological Association, explores the history of eugenics and physical anthropology from the 1890s-1930s in the United States. RACE also features many interactive timelines on the history of race in America from the 1600s to the present and maintains a complete, alphabetical glossary that covers basic and physical anthropological terms. The TalkOrigins Archive features various articles, debates, theories, scientific responses, and history on the controversy over creation and evolution. This user-friendly complete archive is searchable by topics such as evolution, creationism, court decisions, geology, and more. Aboriginal Resources offers an index of historical Canadian Native law cases, aboriginal photographs from the 1800s and up, and an archived database on the Northwest Resistance with biographies and a timeline of events. African Lives, an eight-article series from the Washington Post, chronicles the lives, culture, and traditions of the African peoples in Ethiopia, Kenya, the Ivory Coast, Ghana, Sudan, Senegal, and Abidjan. American Museum of Natural History Division of Anthropology features a vast collection of over 180,000 ethnological objects from around the world, curatorial research covering various anthropological sub-disciplines, and digital images of natural history ranging from the mid 1980′s and up. Being Indigenous includes resources on the different cultures, regions, and lifestyles of various indigenous peoples, such as the Aymara, Yagan, Mapuche, and the Quechua. Cultural Anthropology/History of Anthropological Theory is a Wikibook that covers famous cultural anthropologists throughout the world’s history and explores the earliest known and documented cultural studies. A brief history on the background of the cultural anthropology discipline is included. The Cultural Landscape of the Plantation features comprehensive historical research, photographs, and oral histories on the lifestyles, traditions, and home lives of the African American slaves in the South during the 1800′s. Cultural Survival promotes advocacy for Indigenous Peoples worldwide in regards to personal rights, cultures, and land use. Cultural Survival includes current international news and updates, campaign and volunteer options for involvement, a quarterly publication, and more. Digital Himalaya Project features archived ethnographic materials such as music, maps, rare books, and film from the Himalayan region of Nepal, Tibet, and Bhutan. eCultural Resources offers a cultural resources network with current anthropology news articles and stories from 2005 and up, an international job board and directory of field schools, and a free, weekly newsletter with up-to-date research news. Expeditions: Research in Applied Anthropology is an independent network of applied anthropology scholars with a wide array of articles and project ideas regarding human sciences. The site also features archived past projects for examples of different studies. Exploring Ancient World Cultures gives a complete introduction on world cultures throughout history and includes essays and primary texts on the ancient and medieval worlds. The Human Relations Area Files explore information on cultural anthropology for education and research through an extensive database with manuscripts and archives. The website also features tutorials and webinars on how to use the database, along with a basic guide to cross-culture research. Margaret Mead: Human Nature and the Power of Culture, a resource sponsored by the Library of Congress, features field materials, photographs, and the history of Margaret Mead’s research and life as a cultural anthropologist. People and Plants International offers information, resources, and research on ethnobotany conservation projects, communities, and cultural landscapes worldwide. Sociocultural Theory in Anthropology explores various forms of sociocultural theory, including the spatial, temporal, and intellectual dimensions, and also includes biographies of well-known sociocultural anthropologists. 123 World Language Directory includes a full, alphabetical index with facts and information on thousands of languages spoken worldwide. Alternative Historical Linguistics is an etymological index of language family dictionaries, maps and graphic models of the North Caucasian languages, and much more. Ancient Scripts is a comprehensive guide to language phonetics worldwide. The website as well explores the history of linguistics and writing systems from prehistoric times and up. The Endangered Language Fund offers information regarding funded projects and outreach for endangered languages around the world, along with a native language archive. Ethnologue: Languages of the World offers a complete index with information on different languages spoken in each country, research and outlines on nearly extinct languages, and downloadable software for students and professionals in the linguistic anthropology field. Language Miniatures features William Z. Shetter’s monthly 900-word mini-essays on topics surrounding linguistics and language, with an archive of past articles amassed over the past 12 years. Native Languages of the Americas is an alphabetical index of all Native American languages, research on the Amerindian language family groupings, categorized myths and legends from several tribes, and much more. Phonological Atlas of North America offers comprehensive North American maps that detail the changes in the American English language by region and time period. University of Oregon Department of Linguistics features information regarding historical and typological linguistics, language and cognition, and various fieldwork projects and programs offered through the University of Oregon.